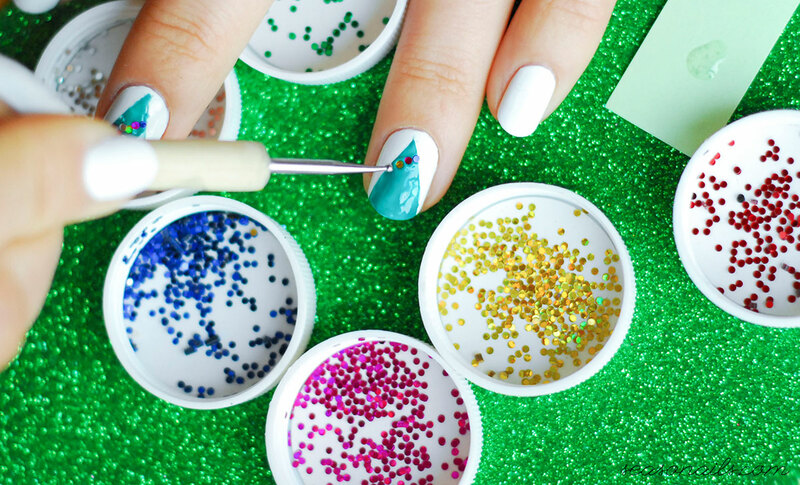 Craft glitter. 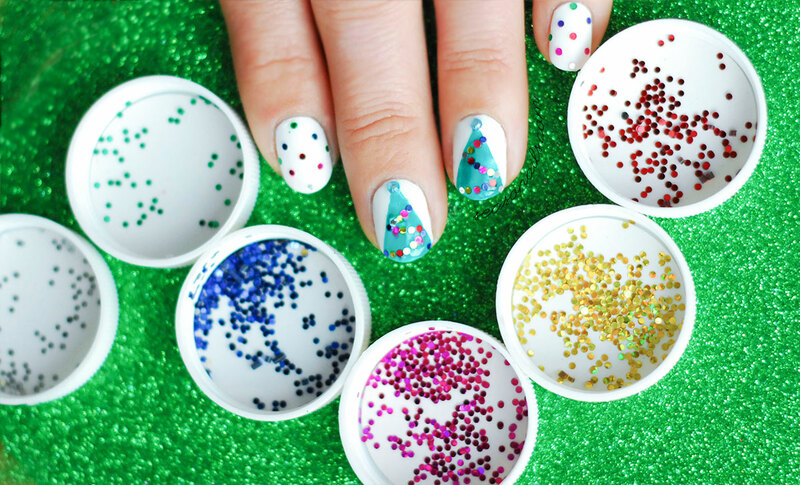 Big, chunky bits of round glitter here and there on the nails – who can dismiss these perfectly festive, joyful Christmas Nails? Especially when stretched across in a string of colorful lights or two beautiful Christmas Trees with sparkly decorations? White. 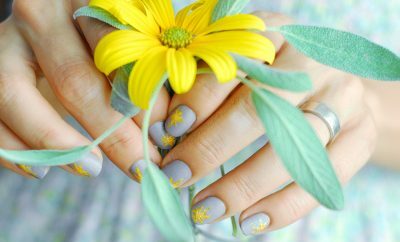 Pure white as a base for this nail art – my choice is Alpine Snow, my trusted white from OPI. 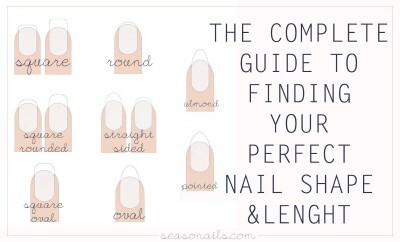 But don’t let that stop you – any white is good as long as it doesn’t stain your nails. Now! Glitter, the more the merrier! All the colors you have, round them up! 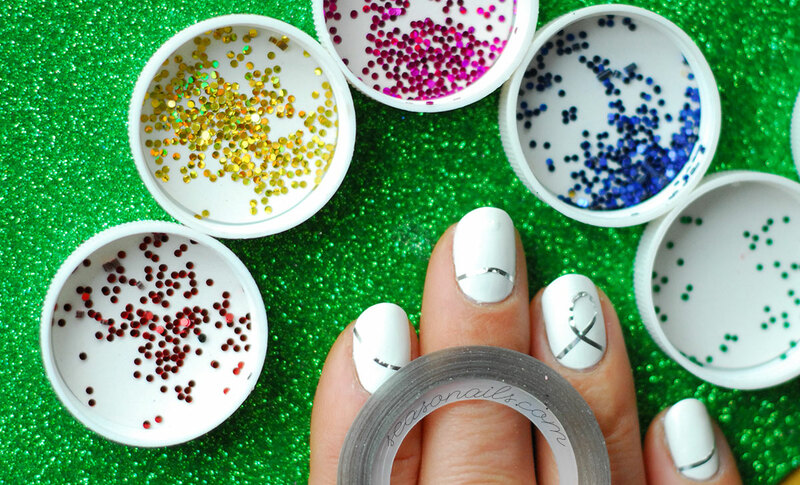 It’s time to produce the most spectacular, happy Christmas nails! Two ways! And you know what? I’m actually wearing these – on the right hand’s nails the string of lights and on the left hand’s nails, the trees! I head no complaints about these but the kids in my youngest’s class were drooling all over my nails when I made Xmas decorations with them last week! Kids don’t lie, right? See also: Silver clouds winter nails! You’ll need striping tape – mine is silver, but you can go ahead and use whichever color you like! (I bet green looks awesome!) The triangles for the trees are quite easy to apply, focus on keeping them straight, you don’t want your trees willowing to left or right. 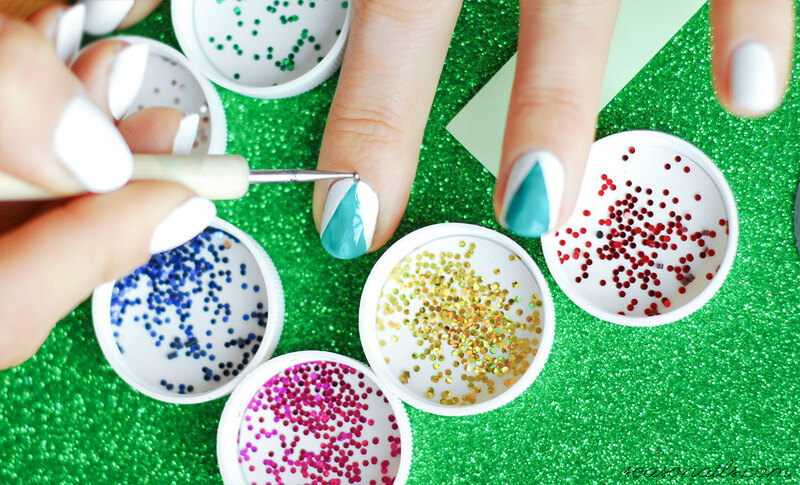 Paint between the tape with the green of your choosing (here’s China Glaze’s Keepin’it Teal) and before it’s dry take the stripe away and start placing the glitters. 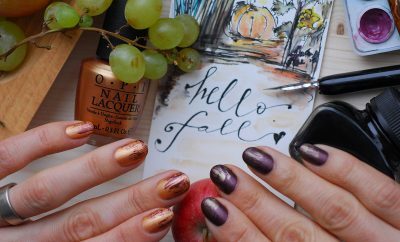 See also: Glitter ombre winter party nails! I did a zig-zag pattern, you can fill the entire tree with glitters with no particular pattern in mind, go ahead and play with it, the end result is so spectacular that tiny imperfections are overlooked easily! I topped the trees with two swarovsky-like appliqués and covered all with a generous clear topcoat. For the other nails it’s quite easy to figure out the how-to : I just used the glitters to make a merry dotticure. See also: More Christmas nails two ways! 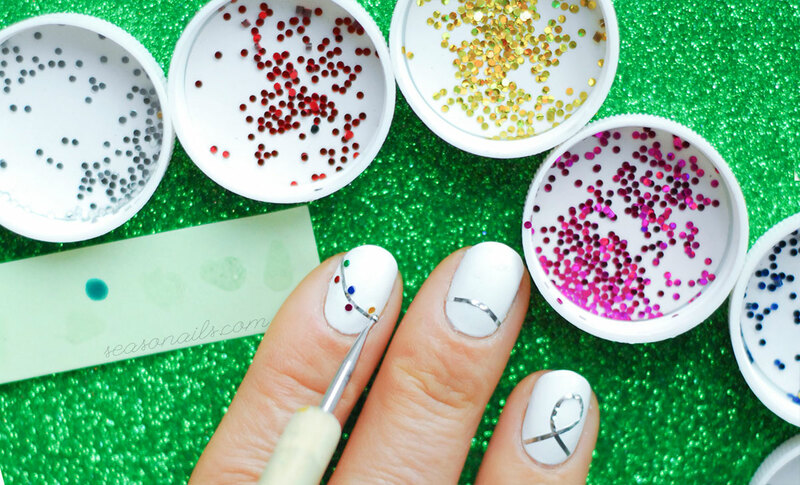 Now – if you take these nails out of the Christmas context and switch the trees for two cupcakes (or even one), you get the happiest (Birthday) Party nails! Cute, huh? 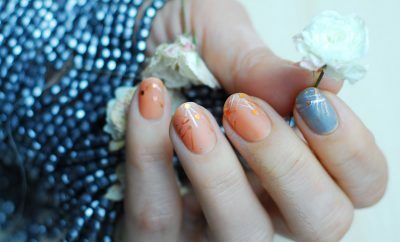 As far as the Christmas lights string nails go – using the same tape I stretched it lightly to create curves (something that’s rather hard to do and the tape might lift off but it’s nothing a thick coat of clear topper can’t take care of!). After placing the tape, I placed the glitter alternating under and above the tape. The result is rather cool and shiny, subtle yet very festive! 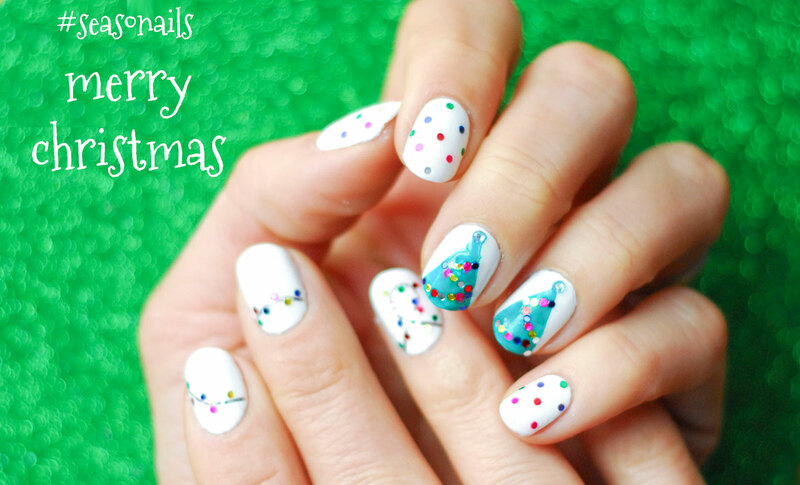 Here you go – my Christmas Nails Two ways! Whichever you choose, I can assure you it will get a lot of compliments! Happy Holidays! 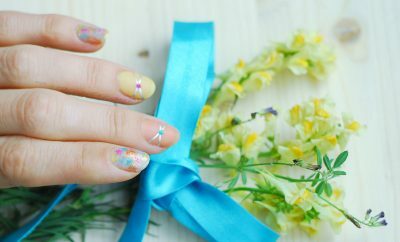 See also: Easiest, cutest Birthday Nails!